They're not always stupid games in Evanston. It just feels that way. History does undoubtedly show to us that there have been plenty of stupid games in Evanston in recent vintage. [gazes sidelong at M00N]. This wasn't a stupid game as much as it was a frustrating game because it didn't need to be that way, but a slow start by Michigan, an excellent opening script by Northwestern, and penalties upon penalties upon penalties made it so. It would be really nice to just focus on the second half, where the defense looked much more like the unit that we have come to expect but to ignore the first half is to...well, sort of do what Michigan looked like it was doing yesterday. Michigan won the toss and chose to receive, which was an initial point of confusion. 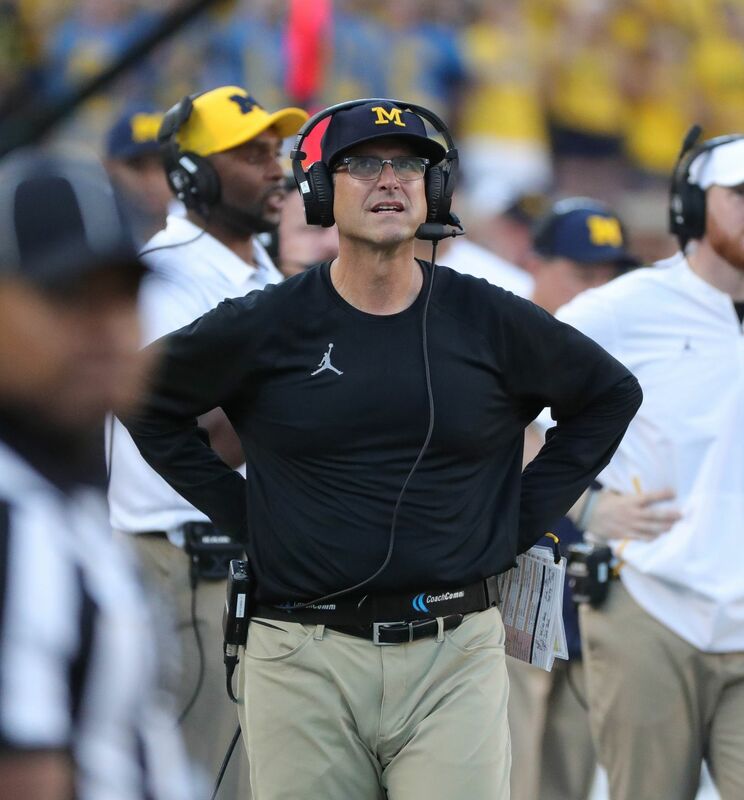 Coach Harbaugh has spoken previously of his love of the opportunity for the "wrap-around" score, where you get the ball at the end of the first half and score and then get the ball back to start the second half. Certainly, you could argue that after last week Michigan perhaps felt that they did not need the wraparound score, after all, the experts in the desert had Michigan as roughly 15 point favorites, so come out, take the ball, get a score, and put an offense that lost its leading rusher during the week in a hole early. But if that was the plan, then it went awry very quickly, with Michigan going three-and-out then Northwestern marching down the field and scoring to make it 7-0 early. 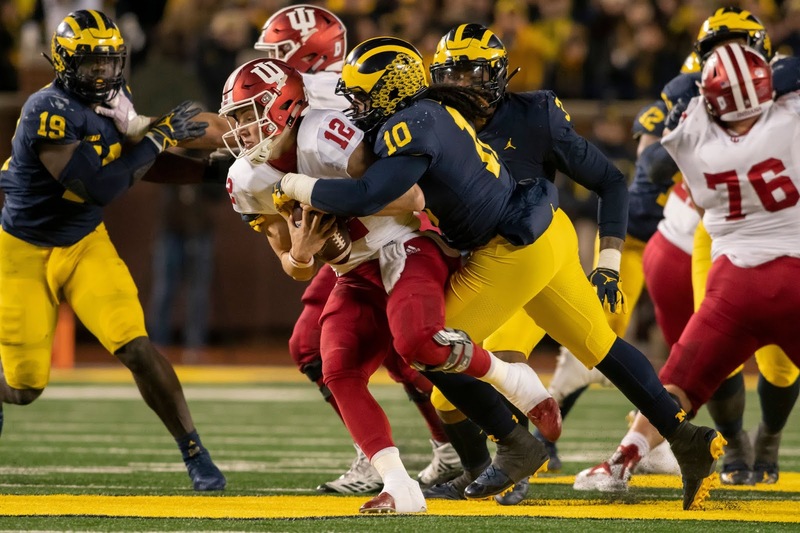 The Wolverines would spot Northwestern another 10 on the next two possessions and found themselves staring up from the bottom of a 17-0 hole as the second quarter began in earnest. 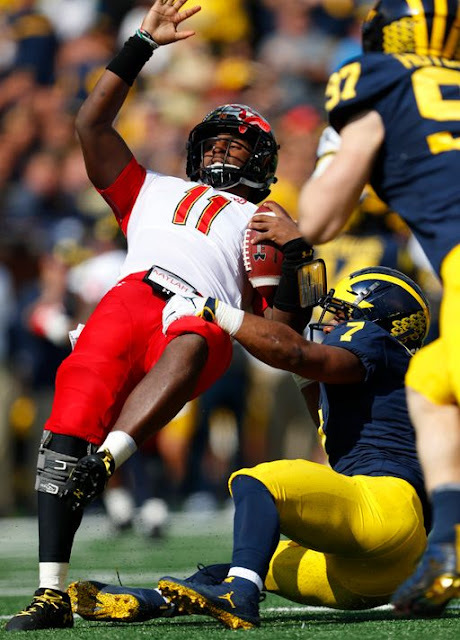 All of the possibilities and realignments of expectations that happened in the last three weeks felt ephemeral, another Michigan team that looks amazing against lesser competition at home but cannot find its way forward on the road, a very daunting prospect given the trips to East Lansing and Columbus that remain on the schedule. But steadily, the things that Michigan does well came back into alignment, including the all-important halftime adjustments. 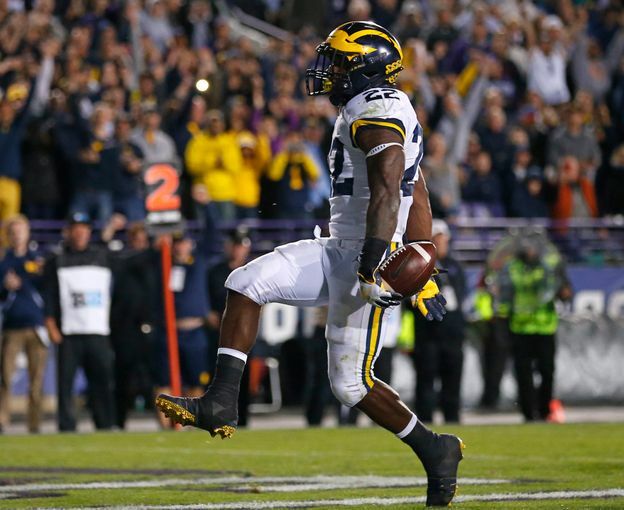 Karan Higdon ran hard, even if on his final touchdown drive, Northwestern had figured out that he was getting the ball up the middle on first down (four runs on first down on that drive, none for more than a yard.) His final touchdown (illustrated above) came after nearly 56 minutes of Michigan not holding the lead. 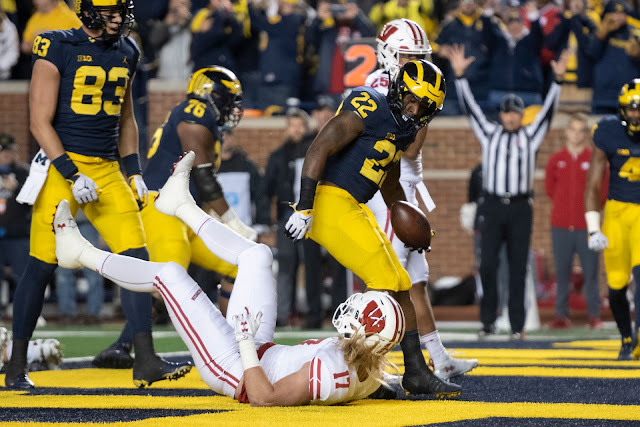 Then defense bared the teeth of the wolf and kept up the pressure that saw Northwestern held to 61 yards on just 27 plays in the second half. That is getting off the field, and that is how you give your team a chance to make a comeback. 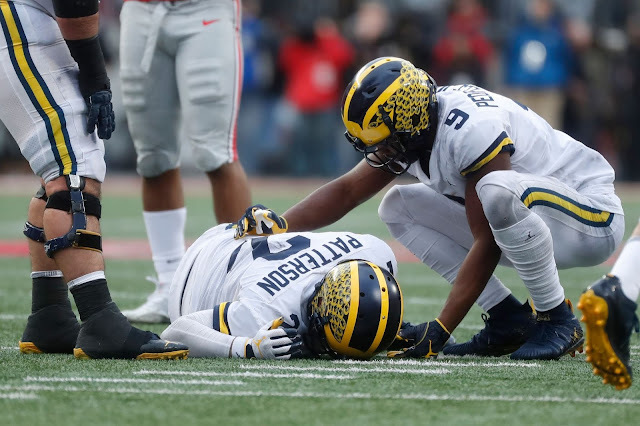 I almost feel like Michigan fans don't appreciate this kind of thing because it's been the nature of the Don Brown defense: dominant, aggressive, and gets off the field on third down. It doesn't always happen, but when it needed to, admittedly against a team that has offensive effectiveness issues. It would be nice to see fewer penalties, but Gus Johnson served up a stat yesterday that essentially said that almost all of the most penalized teams in the nation also had winning records. All of the consternation about yesterday comes back to "what does this mean for WisconsinMichiganStatePennStateOhioState????" and I understand that line of thinking. The future is what we care about because it has yet to be written and we're trying to use what is happening in the present to be instructive. If Michigan wins those games, then a game like this is the springboard to improvement and renewed focus. If Michigan loses those games, then this was the harbinger of what happens when you start slowly and take foolish penalties. We don't actually know anything, we won't really know anything until the games themselves are played. I realize this is trite, I realize this is not useful, but attempting to extrapolate the future of a college football team is also very difficult. Now, to find out what the Big Ten has to say about the penalty from Mars. Because I would really like to know about that one. Devin can hear you, he's just trying to make a larger point. I got an attitude of need." --"Perfect Blue Buildings", Counting Crows, August and Everything After, 1993. Admit it, when Adrian Martinez found Stanley Morgan, Jr. for 32 yards on a third and nine play on the opening drive, you thought "Here we go again." I thought it, the crowd at Michigan Stadium clearly seemed to feel it, the warnings about how the 18 point spread was too generous, how Martinez was better than we suspected. and that this would be a dogfight. The panic lasted all of two seconds when Martinez's next pass was tipped and once more, Josh Mettelus came down with it and six plays later, the rout was on. It was a moment where the promise of the off-season started to actually look like it wasn't just lies told to comfort a nervous fan base. The offense produced more than 44 points for the third straight game. The defense looked like they had taken offense at the doubters and put on a show, four sacks, 14 tackles for loss, and feeling much cleaner on the penalty front, well, almost (looks at Khaleke Hudson). Nebraska would maybe get one decent play on a drive, trying to get something going and the defense appeared to take it as an affront to propriety and snuffed it out. It was only when the second and third string got some reps that Nebraska would actually do anything with the ball. It's the rare 46 point victory that was not as close as it would seem and Nebraska is 0-3 for the first time since 1945. As miserable as last week was at the Big House to watch, this game was a delight, proving two things, football weather remains undefeated and routs are fun when you're not on the receiving end of said rout. 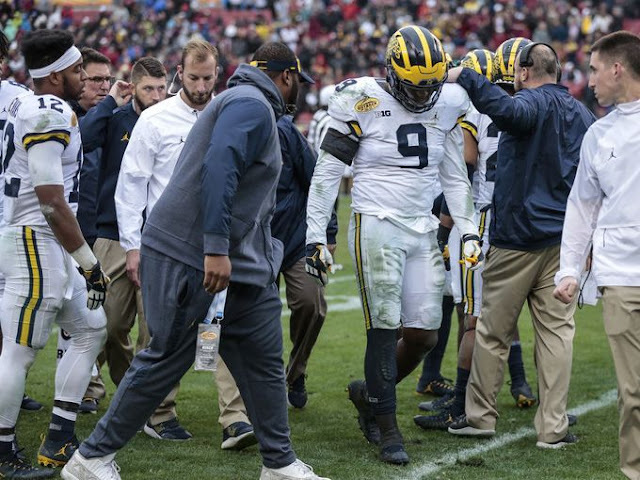 I've sat in football weather at Michigan Stadium for the receiving end of a rout and it wasn't fun, but it wasn't miserable. This was just fun. Even the silly things that made no sense: the drum major doinking the mace toss for the second times in three weeks or the refs and Carl both making weird misspeaks on penalties and yardage, were more on the funny side than bad omens. The fullback getting three touchdowns, well, thats's just Harbaugh reminding you that fullbacks matter. Dylan McCaffery looking like his brother while running out a broken play ultimately called back on a penalty, well, that's just a glimpse into the future. Ambry Thomas taking a muffed punt back for a score, only to have it called back because you can't advance a muffed punt, well, that's just an obscure rule that you didn't know about until just now. Meanwhile, Will Hart is out there AVERAGING nearly 60 yards a punt for the day. I mean, come on, that's just a thing of beauty. Of all the moments of today's game that will stand out to me is Donovan Peoples-Jones punt return for a touchdown. 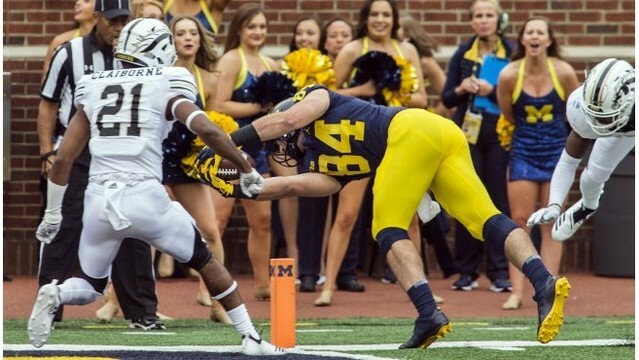 There are several reasons, not the least of which is the notion that so many people have groused that DPJ only ever fair catches and it makes no sense why he is back there. Today was the answer. Oh, sure, it was the critical score that made it 46-0, but still, picking your way through 60 yards of traffic, with a full reverse of field across from the east to west sideline including a spin move that should not have worked, and yet, did, well, it was just excellent. It's even more so when you do it on a day when Charles Woodson is in the house to get his College Football Hall of Fame plaque. All in all, as miserable as the day was last week, today was its diametrical opposite. It's nice to feel good at the Big House. I couldn't find a photo, but dang it was nice to see the broad smile on Coach Carr's face when he handed Charles his plaque. Also, Coach Carr still sporting the quarter-zip, the outerwear of champions. "Way, way, way, way too long." Fun fact: Michigan's lowest win probability in this game was 95%, about the middle of the second quarter. There was, statistically, never any real danger that Michigan was going to lose this game. So perhaps that wasn't the feeling. It was more mild annoyance that Michigan wasn't putting more distance between themselves and SMU during the course of this game. In the stadium, the heat/humidity was relentless, much warmer than any of the weather lookaheads would have seemed to indicate. After the last decade of Michigan football, it seems particularly petty to complain about a 25-point win, but I am sure there will be those in the fanbase who are more than happy to disabuse me of the notion. I am very happy that Shea seems to have found a new toy in "The" Peoples-Jones. 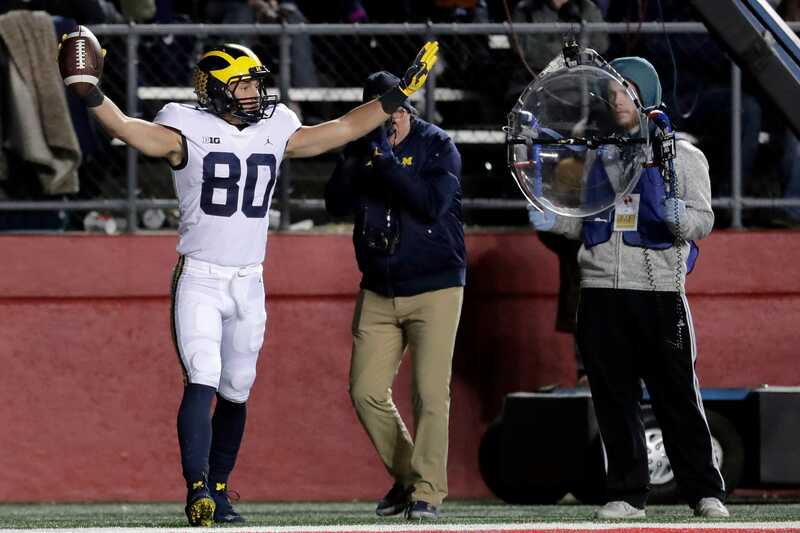 As the gentleman sitting behind me said as DPJ raised three fingers after finding the end zone for the third time: "You get a hat trick any day, any sport, you get to celebrate it." I am loathe to disagree. For so many people waiting for Peoples-Jones to live up to the hype and the stars, today's performance definitely was more than flashes. 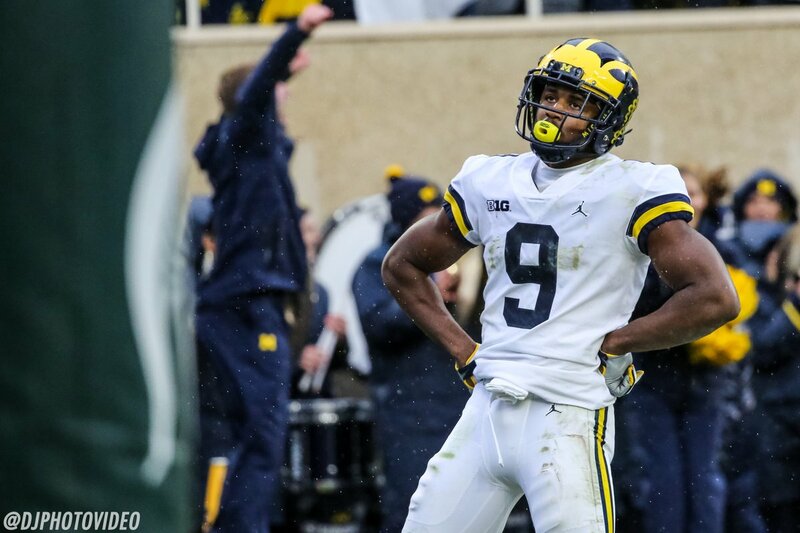 I am very happy that Josh Metellus decided to immediately make up for the PI penalty he drew on a 2nd and 17 late in the half by returning a pick 73 yards to cap off the first half. Fully, a third of SMU's first downs came courtesy of penalties, which made the game feel like it was dragging on interminably. We had reviews of targeting from the booth that hadn't been called on the field. We had reviews that we knew the press box knew weren't going Michigan's way because the video board wasn't showing a replay immediately. I am only surprised that we didn't have reviews of reviews, which given this crew, didn't completely feel out of the realm of possibility. It feels wrong to complain about a win on a day when so many Big Ten teams fell, including Wisconsin and Nebraska. There are no style points. Many of the voters in the polls are going to see 45-20 and not dig any deeper. Michigan won by 25 at home against a G5 opponent. But I will say, this game was one of the least, if not the least, enjoyable Michigan Stadium experiences I have had where the end result was a victory. (Advisory note: I was not at Cincinnati or Air Force last year, because I can already hear you "ahem"-ing me.) It was just a joyless, superheated slog that would not seem to end. So many of the problems that we worried about on defense from the Notre Dame game showed up. 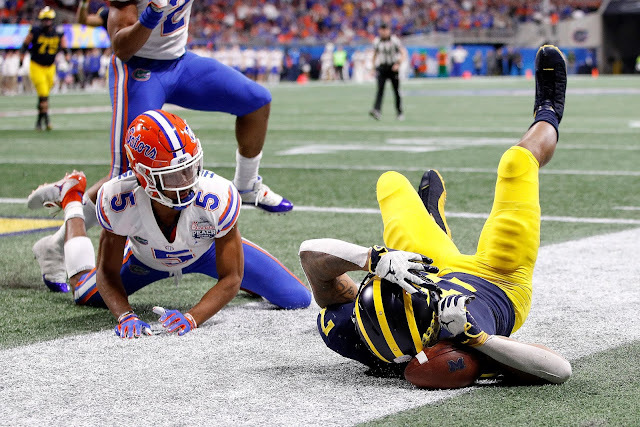 On the plus side, Shea Patterson clearly showed some moxie. One that particularly stood out to me was on the 3rd and 4 from the Michigan 38 with 6:13 left in the 4th quarter. Flushed out of the pocket, he scrambled to the left side. Patterson was still directing receivers on adjustments before finally deciding at the last possible moment to just go and picking up 18 yards and a first down on the scramble. He had just four incomplete passes, which I didn't even realize until I started looking at the stats. The upgrade at the quarterback position this year is what made this game a 25 point win on a day when the defense was not its usual, expected self. I don't want to be BAWWW, and I'm trying hard not to be. So I'll just take the win and look forward to the start of the Big Ten season next week. All your love is just a dream, dream, dream." There's a notion I cannot escape, something like existential dread, but for your football team. I try to push it out of my head and from time to time, I feel like I'm successful but then, unbidden, it creeps back in, sometimes without warning, but more and more lately, I see the contours of the landscape, and it arrives once more. I hope that it is a dream, but it is not. It exists somewhere in the ephemeral space between conscious and unconscious thought. You reach out to chase it down, to see its face, confront it, and banish it, but it always slips out of your grasp, like a confident running quarterback eluding your best pass rush. I worry genuinely that Michigan will never be Michigan again. That this is the permanent new reality, relegated to being a perpetual also-ran in the Big Ten East while schools that have sold their souls to the machine move ahead with no actual real price paid. That even the best possible coaching candidate for this school could not save us from the long decline. Then I worry that I don't care enough about other people's suffering and that the smallness of this feeling makes me petty and cheap. I know I am not alone in this latter worry, Geoff excellently trod upon this ground last week. But we arrived back where we started without ever knowing the place we left, or at the very least, appreciating it. I worry about dumb things, like the fact that Harbaugh's presence at the 2016 World Series somehow transferred the Cubs curse to Michigan football. 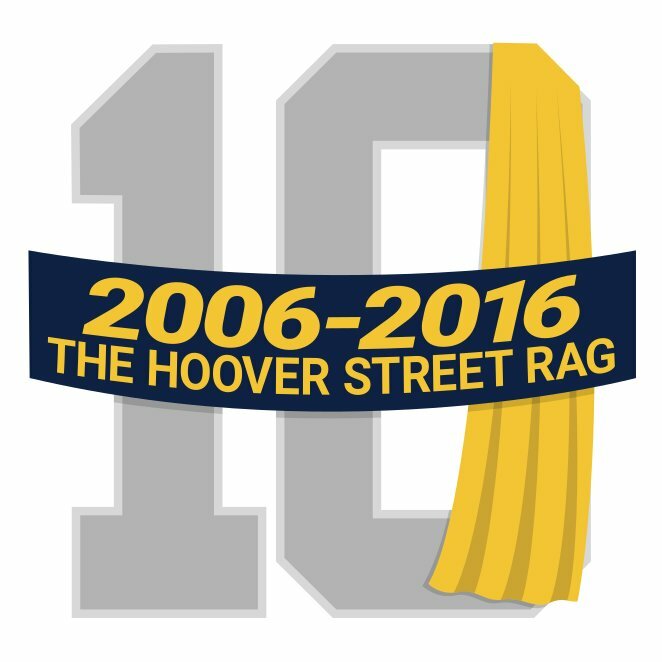 You laugh until I point out Michigan is 10-9 in games since November 2, 2016, since the day that the Cubs curse ended. 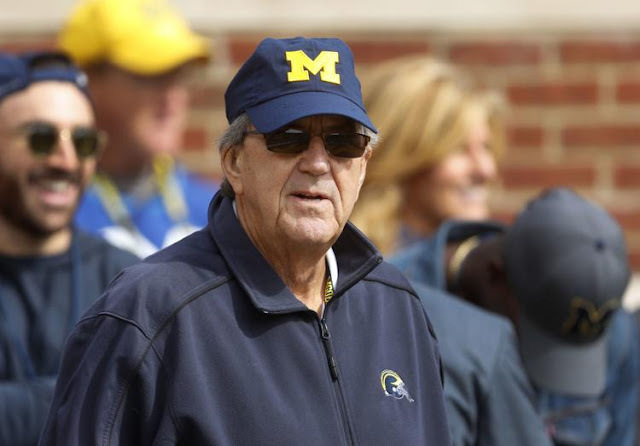 I worry about the idea that Michigan hasn't beaten a ranked team on the road since Bo passed away. 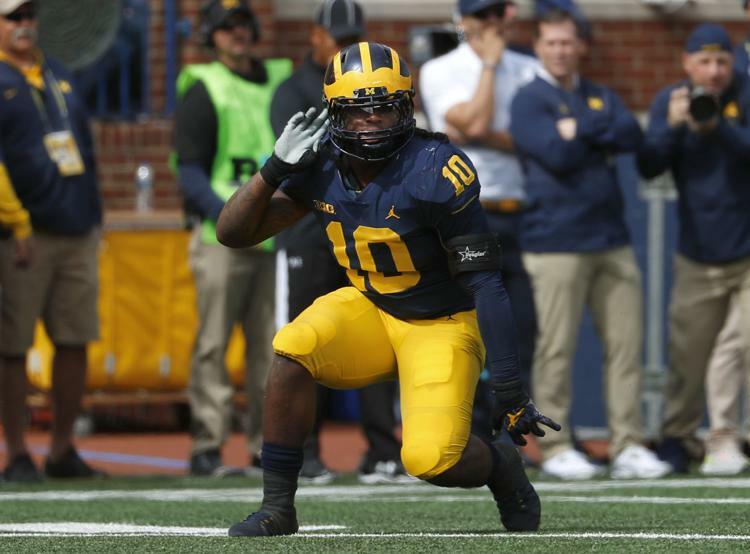 I worry about trying to find supernatural reasons to explain things that come down to Michigan doesn't have a great offensive line and Michigan's defensive aggression, while usually a good thing, can also be used against it by a team with time to plan for it. August is the season of hope for football. The reports trickle out from Fall Camp by design, giving the fan base a taste of the meal they so desperately want to feast upon, wafting the aromas of anticipation and expectation. Everyone is putting their best face on what they are seeing and hearing, and when you are in charge of getting growth performance out of a group of people, it's not that you fool yourself into thinking that things are better than they are, you just convince yourself that it's there when maybe it is not. No one is lying as much as they're just optimistic in the face of a lack of evidence to the contrary. As a teacher, I know I have had this happen to me a number of times, even when I have done my best to temper my enthusiasm to avoid disappointment. During the frustrations of the Rodriguez and Hoke years, I felt that there was a silly nobility in writing through them, that you were sticking with something because you loved it, for better or for worse. I don't know if I feel that any longer for reasons I can't (or don't want) to suss out. I still want this to matter as a diversion, as an escape, but I also know that collectively, people who watch football know so much more about how football works not than they did in the past that it becomes easier to diagnose what we think is wrong than in the past. Knowing what ails us doesn't cure the problem. Let's hope those in charge of fixing it make it happen. She says, "I've forgotten what I'm supposed to do today." --"August and Everything After," Counting Crows, cut from the album of the same name for time, 1993. The most fascinating thing about getting close to the goal while failing to achieve it is the feeling at the end of it. 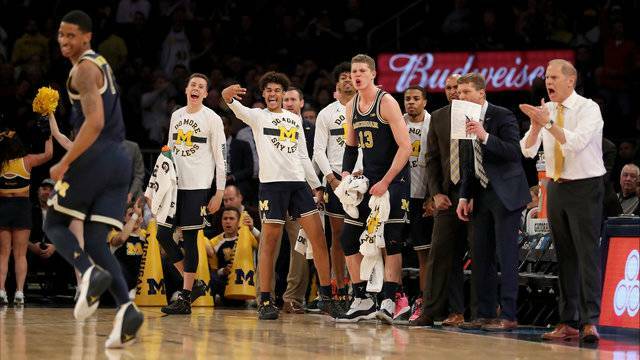 Sports provides so many winners and losers, as is the nature of competition, but of the 68 teams in the NCAA basketball tournament, only one ends their season with a victory. Even if a team that has won five games before succumbing, once more outperforming its seed, it still ends its season on a loss. After all, loss is the business of determining a champion, and perhaps it is much more meaningful to dissect what went wrong rather than what went right. We have statistical analysis to tell us what should happen, given what has happened before, but as any good financial services commercial is required to advise you, past performance is not a guarantee of future results. If sports is just a weighted random number generator around which we construct narratives, it is probably still OK because the tales are fascinating if some effort is put into the construction. Triteness, that fast trope, is easy, quick, and the friend of someone on deadline. It requires no real depths to be plumbed, it uses the familiar horizons of the well-worn path to allow its reader a quick understanding of what happened. If there really are just seven basic plots in the world (overcoming the monster; rags to riches; the quest; voyage and return; comedy; tragedy; rebirth); Michigan's basketball and hockey seasons actually featured snippets from all of them to create a sophisticated narrative that I am not strong enough, as a writer, to fully elucidate for the reader. We create our own meanings, we reflect our own biases in what this meant, trying to understand the seasons as a means of understanding ourselves better. We look into a maize and blue tinted mirror and hope that we know ourselves a little bit more for the first time. To get close enough to see the mountain top but fail to complete the ascent is frustrating in metaphor and potentially tragic in reality. So much of literature tells us that it is the journey that matters, not the destination (Big Ten Network has made a narrative flourish on that very premise). But it is a matter of perspective. If one had fully prepared to make the ascent, had the best guides, the best hear, the best training, it would be effortless to feel the depth of disappointment and realize the abjectness of the failure. It is another thing to be climbing and climbing and climbing and realize too late, like a mountaineering Wile E. Coyote, that you are at a more considerable elevation than you ever thought possible, and truth be told, is probably not healthy for you. That moment where it all evaporates is painful, but the journey, every handhold, every crevasse, becomes etched into your memory because you don't know if you'll ever be back up this mountain, and even if you are, it won't be with this team of climbers. We wanted more, so did they. We didn't get more for reasons of which they are all too fully aware. We also got more out of the climb than we would have allowed ourselves in the first place. Pride and disappointment can safely coexist, if for no other reason than both have stakes attached. Just as we told ourselves that we weren't sure what Poole's shot meant at the moment because we had to see what played out after that, we aren't sure what this season means without knowing if it was a prelude, or a missed opportunity, or both. But since January, man, it was fun while it lasted.